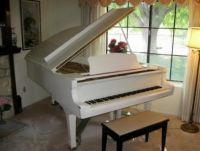 RCA Hollywood Piano For Sale - Misc. pssssst ---- anyone want to buy his laundry bag from Fort Chaffee? If Elvis Presley didnt own it whats the Link.? Elvis is like a Cash Cow for these people they are all just trying to make a Buck using his name and fame, personally i'm tired of it. Next there will be somebody trying to sell his Laundry bag from Fort Chaffee.